A “tense, taut, and thrilling” (Marie Claire) novel about a teenage girl, a predatory teacher, and a school’s complicity from the highly acclaimed, bestselling National Book Award finalist and author of A Short History of Women—“riveting, terrifying, exactly the book for our times” (Ann Patchett). They were on a lark, three teenaged girls speeding across the greens at night on a “borrowed” golf cart, drunk. The cart crashes and one of the girls lands violently in the rough, killed instantly. The driver, Jo, flees the hometown that has turned against her and enrolls at a prestigious boarding school. Her past weighs on her. She is responsible for the death of her best friend. She has tipped her parents’ rocky marriage into demise. She is ready to begin again, far away from the accident. “Devastatingly relevant” (Vogue) and “fueled by gorgeous writing” (NPR), His Favorites reveals the interior life of a young woman determined to navigate the treachery in a new world. Told from her perspective many years later, the story coolly describes a series of shattering events and a school that failed to protect her. “Before things turn treacherous, there’s a moment when predation can feel dangerously like kindness…Walbert understands this…His Favorites begs to be read” (Time). 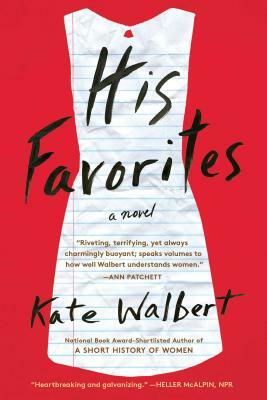 "Kate Walbert's most powerful novel yet... fueled by gorgeous writing, as well as outrage... heartbreaking and galvanizing."